We seem to be having more chill less hot. And I love it hot, but this summer has been pretty mediocre here in the bottom half of the North Island, NZ. Often it gets better around February, just when the majority of us are back at work and starting to dream about the next holiday. 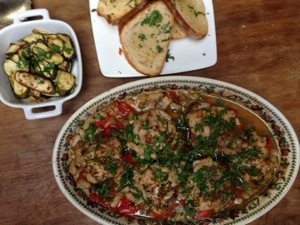 Saturday was not warm for most of the day, I had chicken thighs in the fridge and could feel a Tuscan Chicken coming on. This recipe is a bit different to the usual, inspired by a Bill Grainger recipe (http://www.independent.co.uk/life-style/food-and-drink/recipes/chicken-with-cannellini-beans-and-peppers-8444839.html) I decided not to roast the red peppers but sub them for what I had to hand in the pantry. Bill’s recipe is for 4 people, but there are only 2 of us, so I decreased amounts a bit. Though we still had plenty for delicious leftovers. About 6 Pepperdew peppers, from a jar, cut into thick strips (this added a bit of heat, subbing for the chilli powder in the original recipe). Though not very hot, don’t worry, just a pinch of warmth really. Preheat the oven to 200C/400F/Gas6. Mix the rosemary, thyme, garlic, and lemon zest in a small bowl. Drizzle the chicken thighs with a little oil then rub the herb mix into the flesh. Season with salt and pepper. Tip the beans into a large, deep roasting tray, stir in the peppers, shallots, white wine and stock. Lay the chicken thighs and any remaining herb mix on the beans. Cook for 45 minutes, topping up the dish with a splash of water if needed.